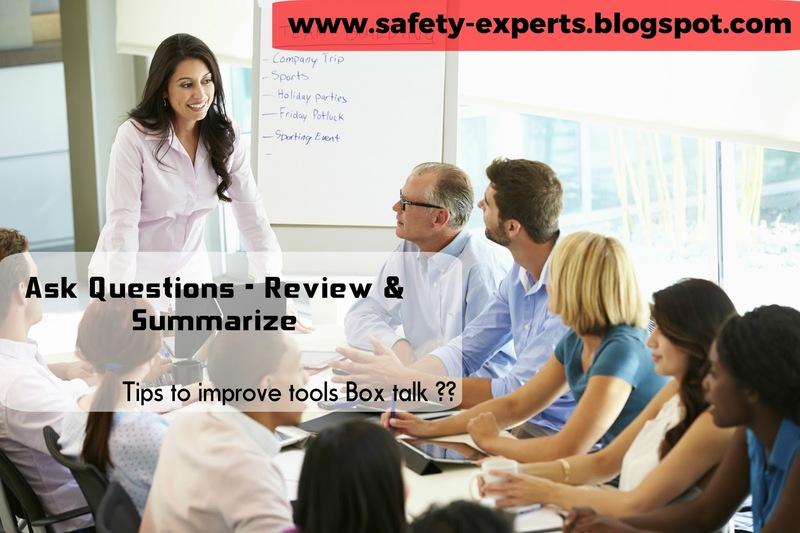 How to make your tools box talk effective? The Most important part of training is that to measure , whether it is effective ? How to confirm that your tools box is effective? Whether the tools box training really reduces the accidents? Whether the workers understood what you have trying to communicate? If the tools box talk is in effective, its meaningless to provide in a everyday basis, If you are curious to increase your effectiveness of tools box talk , this article is for you ! Don't plan tools box training for a mixed category of workers , if the different category of workers mingles in a same window for the tools box talk , it won't be job specific and not effective any more. Also it is suggest able to provide separate tools box talk for each category of workers . If the content of your tools box is irrelevant to the job that the workers are performing, they wont show the interest any more! So ensure the persons conducting the tools box talk is familiar with the nature of job and the safety measures required. Though the person delivering the tools box talk is sound technical , if there is an absence of effective communication ability, if won't be effective and the workers loose their interest and the importance involved in it. So it's preferable that to check for the effectiveness of communication ability and to provide any training if it required. Due to growing industrialization , people tend to prefer working in any part of the world , by this increasing migrant workers , the language places a barriers on the implementation of health and safety. So It is preferable that to select the nominated person to deliver the tools box talk is familiar with the workers mother tongue. Unless it is in their own language , it wont reach . One of the main element of tools box talk is that , it should be delivered before starting the work. Unless the persons attending the tools box talk , they won't be allowed to commence the work. If it seems any one is required a explanations (by their body languages ) give them the details with the simple examples. 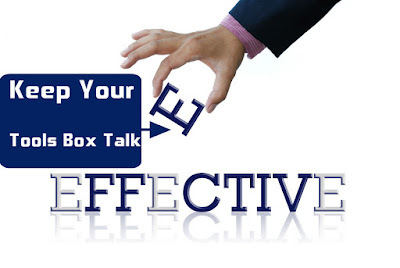 Each of your tools box talk should be starts with the previous meetings and discussions to keep the people aware of the potential importance and make them to refresh by the thinking of past happenings. Also it ensures that the discussions are followed in the workplace. Most of times the workers believe the information's blindly without analyzing at all , remember while you are standing in front each of your information's should be correct , and obviously if you do not include the important issue which needs to be done , consequently you could not expect to be in the work practices . The Emergency procedures to be followed etc. 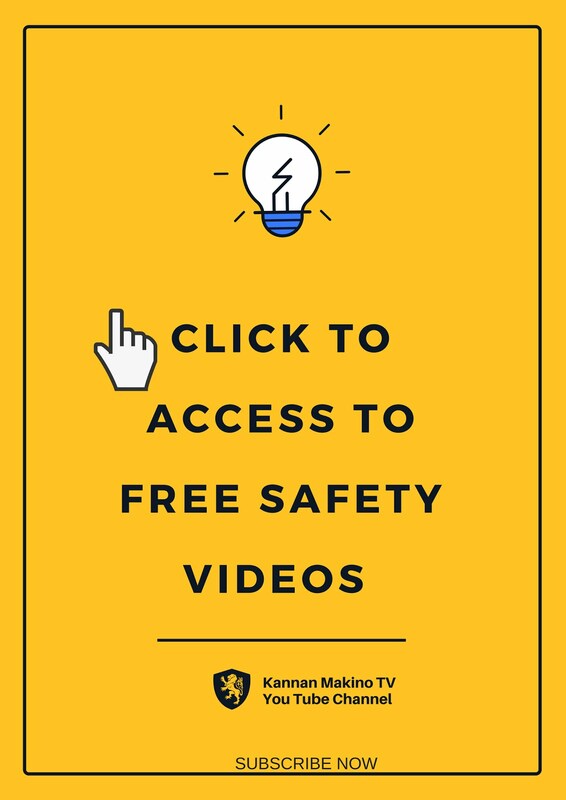 Instead of keeping your tools box talk full of instructions , it is preferable that to include any previous accidents happened in the similar jobs , and their reasons and the consequences resulted from the non compliance. High impact intervention training's are always preferable to influence the workers. The Most important and un avoidable strategy to improve your effectiveness of your discussion is that to motivate the workers involvement , which ensures that the safety is not an insistence and it's a team work . Unless you are motivating your workers involvement , they won't think the safety besides them and not against for. Of course the use of technical words and specific safety terms will show that you are an expert , but understand the tools box talk are not for the employee , who learned safety terms , so Keep your tools box with less technical words , but make sure it is related & all the information are communicated . The use of statistics will not be remembered by your employees , but the simple stories and description of accidents happened in your company in the last years , will make them to understand the consequences , also it is easier to remember for them. But remember your questions should never point out anybody and should not hurt anyone , if it's will spoil all your efforts .